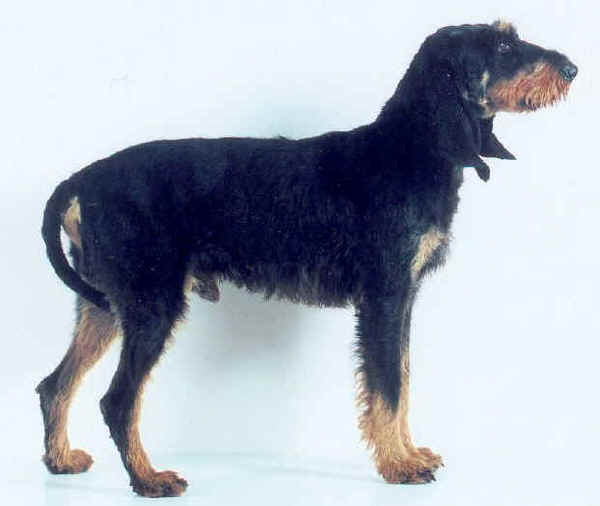 Italian rough-haired Segugio are an ancient Italian hunting dog breed. They date back probably to the time of Phoenix traders from ancient Egypt. They are present, in fact, in several Egyptians drawings at the time of the Pharaohs. Since their introduction in Italy they became very popular and still are today. Italian rough-haired Segugio are strongly built, mesomorphic dogs. Their trunk has a perfect symmetry and harmony on the whole. They have medium built muscles and well developed bones, but a thin aspect. Their body does not present any fat under skin. Italian rough-haired Segugio are very extrovert dogs - lively and playful. They are agile and fast, which makes them one of the best hunting dog in the world. They are gifted with an exceptional sense of smell and find traces of game during hunting very easily. They have very sweet eyes and a pleasant ringing voice. They love helping their master in the hunt and like walking, running, and exploring around in the woods, never getting apart their master. They are a very affectionate and obedient breed.